Traffic Calming is being explored for Montlake, and not just for our main street—24th Ave East. It’s equally important for safety and livability on all the streets of our neighborhood. Developed in Europe in the 70’s, traffic calming is a system of street design strategies aimed to balance movement of traffic with other human interests, like walking, playing, shopping, working—you know, life. Over the years, a number of calming measures have been added to our neighborhood side streets. When you take a walk around Montlake, you can find traffic circles, speed bumps and cushions, pedestrian-controlled crossing lights, marked crosswalks, roadway striping and painting, curb bulbs and good old signage. In other Seattle neighborhoods you can also see chicanes, raised crosswalks, textured “rumble strips,” diverters, and chokers. Some have calmed traffic; some, not so much. Now to Montlake comes even more traffic on 24th Ave E. and seemingly endless Hwy. 520 construction. We’re feeling spill-over headaches as impatient drivers look for shortcuts and faster routes along our residential streets. It sure seems like we need more of the traffic calming methods in additional locations. Jim Curtin, SDOT’s Senior Traffic Planner & leader of Seattle’s Vision Zero road safety initiative knows the whole traffic calming toolbox—and he’s not afraid to use those tools if doing so makes life safer and more pleasant on our streets—all our streets. At the November MCC Board Meeting, Curtin explained that SDOT is still evaluating “a slew of options” for the 23rd /24th Traffic Corridor Improvement Project Phase 3. He stressed that entire “neighborhood traffic calming is a priority, no matter what design is ultimately selected” for 24th Ave E. The other day, he reiterated this whole-neighborhood concern after reviewing reader responses to the November 23, 2016 Flyer article. All along, Jim has also said that for the best solutions to be found, SDOT planners need to learn from the community about specific problems in particular locations. Your observations and experiences can then be crafted into accounts to share with SDOT decision makers. Bottom line: The better SDOT’s understanding of particulars, the more likely their fixes will work for us. So, Montlakers, let’s do our part. We can start by naming specific neighborhood locations and the particular traffic problems observed and experienced there. Write these in the comment section following this article or send them to the Montlake Community Club Board (Board@montlake.net). Montlake Community meetings on Phase 3 will also be coming up in early 2017. Attend those meetings to be informed and to offer your specifics and particulars there. Let’s give SDOT the information they need to provide us with workable traffic calming solutions to our Montlake street safety and livability issues. Calm the intersection at Fuel Coffee, Café Lago and Montlake Bike Shop; I see too many people crossing the street dodging cars roaring down the boulevard. A pedestrian overpass in that business district would be ideal. I want to second the overpass idea- a wonderful alternative! I see instead they are considering a traffic light here which seems like overkill. If folks want a traffic light, there is one 40ft to the north at McGraw St.
We need to fix the infamous 5 way. How about making it a *real* roundabout (as opposed to a rounda-oval) with appropriate traffic flow marking and facilities. Easy to list some of the key problem areas: Any given evening at rush hour (starting as early as 4 p.m. some evenings, but certainly by 5 p.m.) traffic backs up along 24th Ave heading north towards 520 and the Montlake bridge. Typically the back-ups extend to about McGraw or so, although on busy days they can extend further up the hill to Boyer or beyond. When drivers heading north on 24th encounter the back-up they frequently cut over to 25th Avenue East and head north. They tend to cut back over to 24th on Lynn or Roanoke, but some of the savvier drivers know the back alley/bike routes and they also use the alley north of Roanoke to get even further ahead of the traffic. This is a big safety issue since there are many pedestrians, kids playing, dogs walking and especially bicyclists along this route (it is a bike bypass route), and the drivers jumping the traffic back-up typically are in a hurry and are not paying much attention. We see several car-bike collisions every year (although it’s sometimes the bicyclists fault for flying around blind corners). I also know that people often cut through the side streets east of 24th at these times to get to Lake Washington Blvd, rather than wait through traffic to get to the proper intersection. I have also seen people head west of 24th and cut over to Roanoke to jump ahead of the traffic on that side of 24th. On rare occasion I have seen Lake Washington Blvd. westbound back up to the arboretum entrance and have seen people do U-turns on Lake Washington Blvd and cut through the neighborhoods between the arboretum and 24th to get ahead of the back-up on Lake Washington. The problem is that everyone wants to get to 520 or north of the Montlake bridge and there is too much congestion between those five traffic lights (Lake Washington Blvd., the 520 exit, Shelby, Hamlin and Pacific) so the back-ups require waiting for a long time, often through multiple light cycles at each intersection. 24th Avenue headed north is the slowest moving of the lot because everything is funneling into 24th. Which is also why people waiting on 24th are the most likely to explore side-streets to get around it. Which is also why reducing the number of lanes on 24th will just make things much worse. There aren’t any other good alternatives to get to 520 or north of the Montlake bridge without using 24th. I have lived off Montlake Blvd for 35 years and in the Staging Area with another 10 homes for 3 yrs. until the Bridge Deck is Full. The GOAL is to beat every car to the Montlake Bridge deck so they do not have to wait 2+ light signals. Signs have to be put up to stop the pile on the Deck. If it were empty for the next light turn there would be NO leftovers from the last turn to have to wait. This is a major problem for this intersection going North and those getting off 520 turning left as well as LWB constant Right on Red. THIS will never get better only worse, the construction and bad decisions will not be over for 5-6 yrs. I agree with the person that said 4 street lights from Shelby to Lynn is a few too many and more coming. There’s also a major problem, especially in the mornings, on McGraw Street as cars cut through to avoid the backup at the 5-way. Despite the traffic island at 16th & McGraw, cars manage to speed through this two-block area. Within just a few houses from that 16th & McGraw intersection, there are at least 7 small children, plus more who come to visit and others who are headed for the Community Center playground. It’s also a bicycle route coming from the Bill Dawson Trail. Speeding cars simply shouldn’t be part of that mix. All of what Paul said PLUS speed control on LWB, especially between the arboretum and the new stop sign at 24th. It is a narrow road with many driveways in just a few blocks, families with kids, and bicyclists. High speed and fast accelerations have always been a problem on this stretch, but it’s gotten worse since the removal of the stop sign at the north end of the arboretum and increased congestion at the Montlake Blvd / 520 interchange. I think people are so frustrated after sitting through that congestion that they’re even more likely to ‘gun it’ and speed along LWB (especially southbound). Just this week, we witnessed the aftermath of a car vs. cyclist collision at LWB and E Roanoke, and I have lost count of the close calls. This stretch would benefit from some speed cushions and/or raised crosswalks (since there are two marked ones already). One short cut people use from 24th is to go west on Boyer, cut north onto 23rdE, then onto down-sloping E Newton, taking a corner onto 20thE. From 20th and ELynn, traffic goes either north or west. There needs to be some kind of calming on Newton as cars pick up speed going downhill, taking the corner onto 20th before they can see who might be coming up the street or who is on the street. There have been small fender bender and child/pet scares in this area over the years, increadsng with frequency of late. With more traffic, one of these events could be tragic. The Newton/20th connecting streets have no parking restrictions so we already struggle with out-of-area parking, most likely for UW commuters. Boyer Ave E between 24th Ave and LWB (i.e. eastern side of 24th Ave) is a major blackspot. It’s narrow and crooked with poor visibility and is marked 10 mph but drivers often fly down it much faster. Often there are cars (legally) parked on the eastern side of the street between 25th and 26th, and drivers going up or down must wait for oncoming vehicles, causing jams back up to 24th and down to LWB. This small street is just not designed for the massive amounts of traffic (and often traffic jams) sourced from Madison Park/Madison Valley in the mornings and evenings. People who are held up by backed up traffic east of 26th (coming up from LWB) will sometimes aggressively cut down the north end of 26th, a designated bikeway which is heavily used by commuter cyclists. The stretch of 26th between Boyer and where it turns into 28th Ave E is also heavily used as a cut-through, and many drivers use excessive speed on this small residential street. 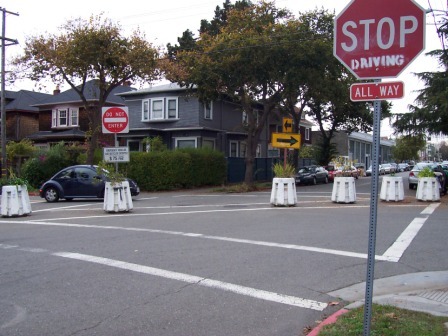 Would dearly love to see local streets broken up block-by-block with something like these, to prevent cut throughs by non-residents: http://www.localecology.org/images/trafficcalming_diagonalbollards.jpg; or with the alternating one-way blocks used on some backstreets in Portland. Thank you for listening! one thing that could make a small difference is the traffic light just before the Montlake bridge is out-of-sync. The light for the northbound traffic on 24th street turns red about ten seconds before the light for the southbound traffic. During that time there is no reason at all to back up the northbound traffic, because the pedestrians and turning cars have to wait anyway for the other light to turn before they can walk/turn. This will back up the traffic on 24th even more than it already is. The traffic on Boyer E. between the traffic circle and 24th is a nightmare. Getting in or out of a car parked in front of our house is truly dangerous, especially at rush hour. The speed bumps which might have helped are so little and narrow that very few cars slow down at all. It’s easy to drive with one wheel on the flat which nulls any impact or incentive to slow down. Not sure what else can be done but should the city be planning other speed bumps in Montlake, let’s make sure they’re high enough to slow down traffic. I agree with all of the above comments. I too live on Boyer, near 22nd. There is so much speeding traffic that bicycling can be very dangerous. (In 2006 I was bicycling home from RBHS and was hit by a car at E. Howe and Boyer.) There are quite a few children who live on Boyer and it is especially dangerous for them crossing streets. etc. The speed bumps have done nothing, as stated earlier. The population of Seattle and its density will continue to explode. When city speed limits were first set, this was a small city with relatively little traffic on Montlake streets. Time to reduce the speed limits even more than the recently announced ones. The signs along Boyer still state 30MPH. Be safe, neighbors. We live on the north end of 22nd Ave E near the Montlake Market and see traffic blockages during nearly every day’s two rush hours on 22nd, on 24th Ave E, on Montlake Pl E (24th Ave transition to Montlake Blvd E) and on E Roanoke St. Please consider my comments listed below. It appears that CoS has designated 22nd Ave E as a bicycle route made ‘safer?’ by the addition of stop signs at all intersecting streets and speed bumps, 1 per block. Is this it? – Very few bicycles seem to use it. Five traffic lights in approximately 1000 feet, from E Shelby St to E Roanoke St, was a doomed idea from the get-go. Given the difficulties simply making this major intersection basically functional, it would be a good idea to keep this intersection level as it crosses the 520 canyon. Replace the buried sewer pipe with a shallower system – add pump if necessary. This non-signaled intersection is constantly blocked by rush-hour traffic waiting for the light at the Montlake Pl E and E Roanoke St intersection preventing 22nd Ave E residents from entering or leaving 22nd at that location. The addition of striping and signage would help to keep the intersection clear. This intersection, which was only adequate pre-new 520, now is further burdened by the one-time Arboretum traffic (+/- 5,000 cars/day?) now routed onto Montlake Pl E. It is also the nexus of all the north-bound cut-thru traffic. It is too close to the Montlake Pl/E Lk Washington Blvd intersection – especially if that intersection is raised 5 feet! – and should be re-designed to be compatible with the larger traffic flow. Maintain residential street parking on both sides of 22nd and all Montlake streets. Prohibit rental cars (GoToCar, Reach, etc) from parking on 22nd – there is ample space on E Roanoke which is never used by residents. Street parking is needed by the residents on 22nd, and thru-out Montlake, as many houses do not have off-street parking. The rental cars sit there sometimes for days at a time, taking up two spaces and forcing residents to park some distance from their house. The occupants of the rental cars usually get on buses to anywhere from our Montlake transportation hub. Patrol 22nd Ave E, and other streets, for UW Hospital swing-shift workers who park on 22nd for no charge. They arrive around 1430-1530 and leave their cars there until the shift ends. 22nd Ave residents are forced to park a block or more distant from their house when arriving home in the evening. There are often six non-resident cars on just the small block of 22nd Ave E between E Louisa St and E Roanoke St.
All side streets in Montlake are essentially one-directional due to the narrow right-of-way and the need to park on both sides of the streets. Morning and afternoon rush-hours often result in traffic jams at the roundabout at the intersection of 22nd Ave E and E Louisa St with cut-thrus from both east and west trying to get to the bottom of 22nd Ave E at E Roanoke St. Signage of a restrictive nature at the arterial ends of those streets could help to reduce cut-thru traffic. Turn the one block of 22nd Ave E to SOUTH-BOUND only between E Louisa St and E Roanoke St to discourage traffic on 22nd. The same notion may help at the appropriate location on 25th as well. I would like to see some attention paid to Lake Washington BLVD from the stop sign at 24th through to the Arboretum entrance both in terms of speed reduction and general traffic flow. East/Southbound cars routinely drive 35-45 mph, sometimes more. The same is true North/Westbound at times when traffic isn’t backed up to Roanoke, Miller or even further. I regularly see cars drive in the oncoming lane to circumvent the lane dividers that prevent left turns into the neighborhood on 26th/Calhoun, Miller and Roanoke. I’ve seen cars high-centered on the divider at Roanoke. I’ve seen cars driving the speed limit (or close) get passed by other cars. Traffic (and especially cut-throughs) on this stretch will only get worse when the eastbound 520 onramp at the Arboretum is removed. Toward that end, I second all the comments about Boyer between LWB and 24th. The entire 24th Street project is a fiasco. It is behind schedule, over budget and is part and parcel of SDOT’s over-arching war on cars. 24th is a major north-south arterial for which there are very few alternate routes; especially if one’s destination is north of 520. The traffic congestion we are experiencing now is nothing compared to what will result from the 24th Street project, if it ever is completed. And with WDOT’s past [adding a traffic signal on Montlake] and contemplated actions, some of which aren’t made public until the last moment, the future appears bleak. But out of the foggy gloom, smiling and friendly WDOT and SDOT representatives arrive from time to time on our doorstep, after the harmful decisions have been made, to proclaim that they are here to listen and to help. All we have to do is come up with ideas that will successfully mitigate their absurd decisions. We live on E Howe St,- the ~ 2 block section that traverses between E Blaine St and E Lynn St; often referred as E Howe Alley. As many of our neighbors know, someof the homes on East Blaine St and all of East Newton St garages are located on this street, however, several of E Howe St homes/front yards face this street. This is a lovely street for walking, and many people do, however, it is a narrow street with NO sidewalk, NO parking – either side – therefore, walking on our street is often taking life in hands due to cars that speed along this section of E Howe St (babies in strollers, people of all ages, kids – seniors, folks walking dogs, etc.). I cannot tell you the number of times I’ve stepped out of my door, walked to the curb (approx ~12 ft) having to jump back quickly to avoid being hit by a car. Our section of E Howe St easily qualifies for both: “10MPH Residential Street” signage -AND- speed bumps. I do hope my suggestions for signage and speed bumps will be taken seriously! Traffic on 19th Ave is often much too fast for kids, seniors, etc. trying to cross to or from the stairs at Lynn or the trail at Calhoun. The problem is compounded by the fact that northbound traffic can’t be seen soon enough because of the turn at 19th and Lynn, whereas southbound traffic can’t be seen soon enough because of the bend between Calhoun and Miller. Speed bumps on East Foster Island Road. Kids and other pedestrians are easily lulled into thinking this is a dead-end park road, expecting fairly slow moving, fairly alert drivers. But in reality, there are a number of blind corners here, and drivers are speeding through here with lead feet on their way to Broadmoor. Accident waiting to happen. I have seen cars screech to a halt to avoid pedestrians several times. How to remind pedestrians, bike riders and drivers that Boyer Ave E. between 23rd and Lake Washington Blvd is a narrow, windy street that is residential and serves as a pedestrian walk through to the Arboretum? People continually stop to ask, “Which way is it to the Arboretum?” A sign would help as would a pedestrian crosswalk between 25th and 26th and before the sidewalk ends on the south side of the street. This is a busy pedestrian thoroughfare for walkers and runners. That’s great but let’s make it safe. Infinite cars lined up. And buses to most places I go to from montlake (UDistrict/Fremont/SLU) are not much faster than walking there on foot. My daughter and I missed a speeding BMW by a few inches last Thursday morning as we crossed Lynn at the 5-way intersection on Boyer to catch her school bus at 7:30 am. Cars accelerate as they come around the median and seem to have no sense that people might be on any of the cross walks that surround the 5-way. It is nearly impossible to be careful enough on these cross walks. Even if you look ahead and see which car might be coming from the other 4 entrances to the intersection, they come so fast that you don’t have enough time to get across. There is at least one school bus stop on Boyer at this intersection and this level of danger is simply unacceptable. Somebody is going to get killed if we don’t do something. There are school children crossing these streets on their own. I would like to see signs all around this intersection asking people to slow down and reminding them that there are cross walks all around the median. The plants in the median perhaps decrease visibility. Any solutions to this would be extremely helpful.